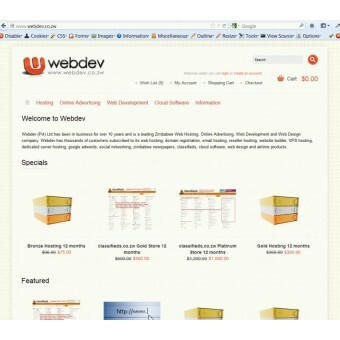 About 2 months ago, in line with the new strategic direction for the company, Webdev introduced a hosted cart solution. According to the founder, Garth Drummond, the company is gradually moving away from the usual website development work that has been their work for more than 10 years now into hosted web solutions and the shopping cart is the start. The development is timed along with Zimswitch’s introduction of Vpayments, an online payment solution that makes shopping carts conveniently usable to Zimbabwe’s internet population. A sample of such a shopping cart is Webdev’s own website: www.webdev.co.zw, which is using such a it to sell the shopping carts. If you are wondering how this is different from Webdev’s classifieds storefronts, the key difference is that a merchant gets have it on their own company web address, and can heavily customize it to suite their branding; if they want. Another key feature worth mentioning is that those merchants that already have storefronts on classifieds.co.zw will be able to import product listings to into the hosted shopping cart. The prices of the hosted carts range from $30 a month to $900. Check details here. Right now, ofcourse, payment option are limited to bank transfers (RTGS) and cash on delivery, both methods that haven’t had any serious traction as far as eCommerce is concerned because, well, they are not ‘online’. Webdev couldn’t say when they’ll have Zimswitch’s Vpayments live on the shopping carts only indicating it’ll be soon. Once they get the green light, Webdev says they also have the option for byers on the classifieds site to stuff using Vpayments. The classifieds website is the biggest online classifieds in Zimbabwe and arguably one of the most successful (business-wise) web projects in in the country. As long as they(Webdev) dont turn out to be a monopoly with the VPayments guys not making efforts to make the registration process less cumbersome for the average, prospective ecommerce developer or online shop owner. Just came from the Wedev site. I see they have made a huge improvement. I wonder how competition will play with Zimazon. Congrats Techzim I see you have hit 5022 Facebook followers. I Just hope V-Payments doesnt get too cozy with Webdev thus stunting the potential growth of other players in the business that may or may not have even better products for the end consumer. Unrelated – Using a purchased template (shoppica) doesnt give a good impression of their ‘custom development’. Its not a bad thing to purchase a template, but for a web development company?? ?